The use of a wall hack allows a player to see enemies, items, supply drops, cars and other important game items through walls, allowing them to loot more easily, find or avoid players and generally survive a lot longer, therefore earning more XP, rewards, Bp and loot crates. 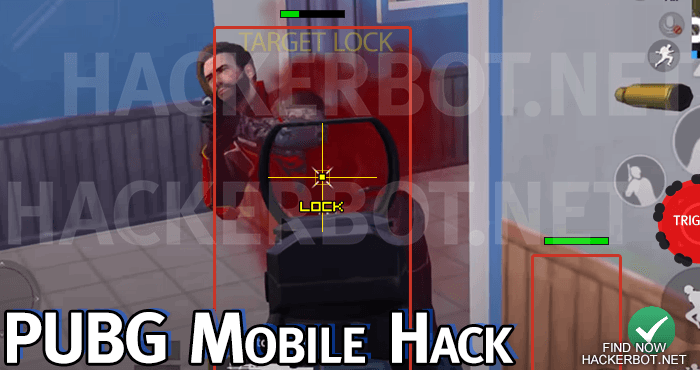 A wallhack on mobile will almost always come in the form of a modded APK or iOS mod, which means that the code of the game client has been modified to show you enemies and items by default. – However, as things are right now in 2018, there are not many programmers skilled enough just yet to create extrasensory perception cheats for mobile games just jet, which means that being able to download a PUBG Mobile wallhack for free is a rare thing indeed. However, if you do get one, it will increase your survival in the game by a lot, since you will know where to loot that first assault rifle and are therefore more likely to survive the first minutes after landing on the map. 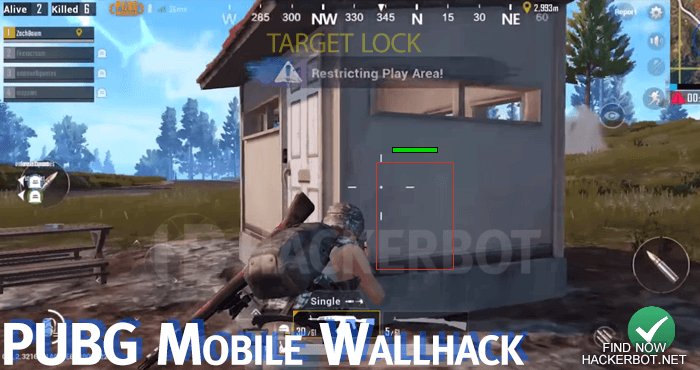 Overall, wallhacks are just about the most fun hack to use in PUBG mobile, since they do not make the game less fun or challenging, neither annoy other players, which means the chances of a ban are minimal to non-existent for the use of a wall hack. 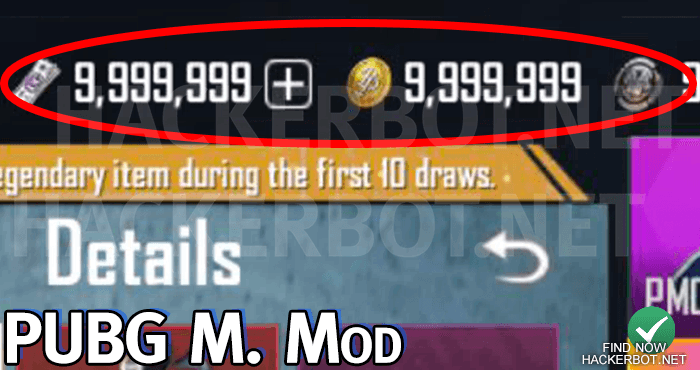 To find working mods for PUBG Mobile use this method. Auto aiming mods and apps are bots that will automatically aim and shoot for you if you hold down a button. While this may sound simple, it is one of the most sophisticated and powerful hacks available for PUBG Mobile and also exceedingly rare to see. Most ‘aimbots’ for Android and iOS games wil come in the form of increased aim assist. In this kind of auto aiming cheat the games default aim assist has been modded to do a lot more of the aiming work for you and other mods will actually create their own aiming scripts, but those are still extremely rare on mobile devices at this point. 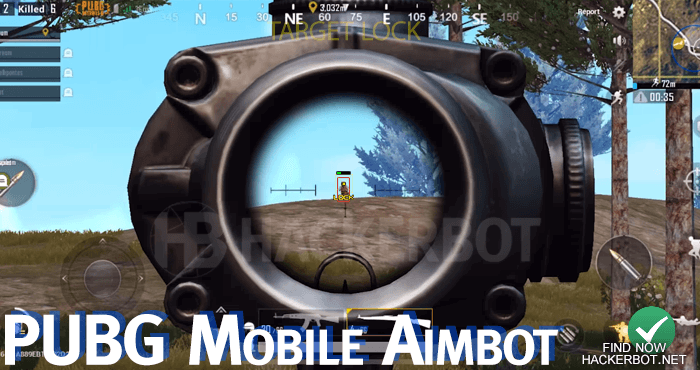 We generally recommend against the use of PUBG Mobile aimbots, since the risk of getting banned is generally a lot higher than if you were using other hacks or mods. If you are going to use a PUBG Mobile aimbot, please respect your fellow players and do not abuse it, as it will get you banned from the game and you will certainly deserve that fate. Tencent is not known for being lenient with identifiably cheaters. When downloading PUBG Mobile Mods make sure you are downloading from trustworthy cheat providers. Use our FreeFinder to find free mods, hacks and downloads for PUBG Mobile. Do not fall for human verification scans, surveys and fakes. 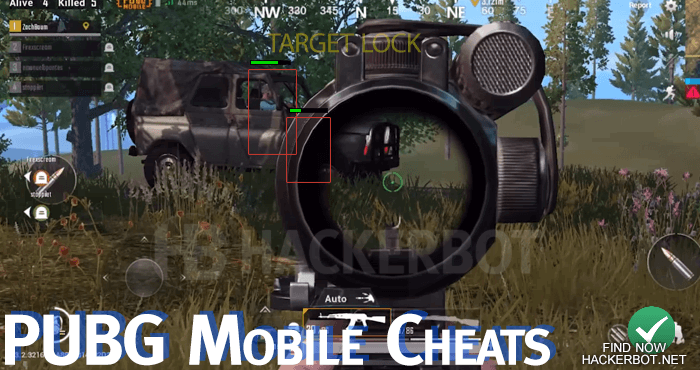 The way these actual cheats are implemented into PUBG Mobile is in the form of Mod Menus that are usually downloaded as a game file (APK mod or iOS mod) that comes with a menu that allows you to switch every single cheating option and every single scrip included in the PUBG Mobile Hack on and off. Such a mod menu ma activate all kinds of cheating options ranging from claiming free crates for free skins, UC and other goodies to actual trainer options, such as aimbot, wall hack, ESP, noclip, nospread and other powerful cheating options. 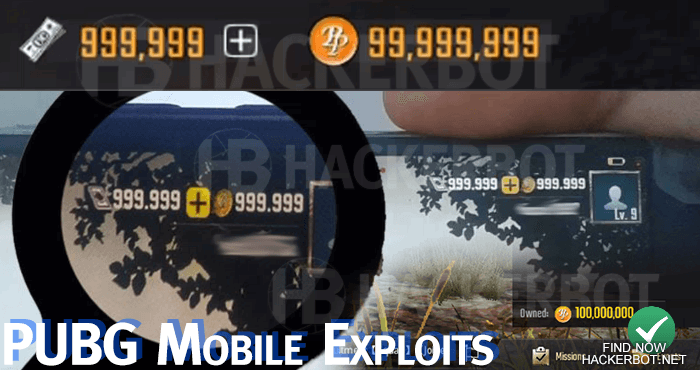 Mod menus are the way most players prefer to use cheating tools in PUBG Mobile, because they are easy to download, simple to use and may come with anything from scripts, simple mods to the best hacks available for PUBG mobile online. However, it does pay to be careful when using any of these apps, since Tencent Games are not known to deal nicely with cheaters and hackers in games they develop and publish. So be sure to create a 2nd account to test any hacks on before switching over to you primary PUBG mobile account and trying to script there. Using simple game cheating tools on PUBG Mobile is not recommended and even dangerous! Using apps like gameguardian, lucky patcher, freedom apk and others can get you banned from the game. The only safe way to try and manipulate game memory is to use the stealth app installed by GameGuardian on Android, which is least likely to get detected. However, since PUBG Mobile is an online game, there is really no use in using tool apps to try and hack the game. Battle Points (BP), items, skins, crates, exp, vitality and daily objectives cannot be hacked using any client-side tools. There are no cheats to get sniper rifles, such as the AWM, nor cheats to spawn AK or M4 assault rifles, as some have suggested. 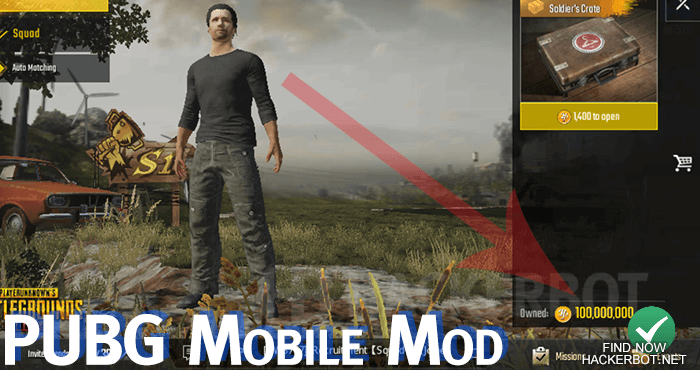 Cheating in PUBG Mobile, the shooter, will have to be done through professionally created mods and most of them will not be available for free download din the long term. Another reliable way to set up scripts would be to use emulators with included script functionality as well. Some people also use scripts and bots to AFK farm PUBG Mobile for Bp, dailies and crates, but we do not recommend that you try this, since it will be one of the first things that Tencent Games will ban people for, if they dig out the glorious ban hammer. Again, any hack or tool that claims to allow you to get unlimited UC or BP in PUBG Mobile is not real, is fake and a scam. Please, do not fall for these fake cheats floating out there on the internet and do no download any of them of complete any ‘human verification’. – PUBG Mobile is an online shooter and all your skins, unlocks, your health, account data including money, bp, uc, XP and so on are all stored on the game servers and cannot be affected by any tools whatsoever. Please stay safe and realistic when looking for working cheats.